← Who will foot the Royal wedding bill? It seems like yesterday that Harry Potter and his friends started out at Hogwarts School of Witchcraft and Wizardry. J. K. Rowling’s Harry Potter series has been around since 1997 with the release of the first book Harry Potter and the Philosopher’s Stone. The series has been a great part of my teenage years. I was introduced to the series in 2002 when I was 15. By then, the first four books and the first film had already released. I do not usually read fiction but the Harry Potter series was an exception. After reading a few pages from Harry Potter and the Philosopher’s Stone, I was impressed by J. K. Rowling’s ingenious creativity and imagination. I was hooked onto the series instantly and went on to the next book in the series. I have been in the same age group of Harry and his friends since the beginning of the series. By the time, the last book Harry Potter and the Deathly Hallows released in 2007, I had become a Harry Potter maniac and found myself standing first in the line at the bookstore to get my hands on the first copy before they were sold out. 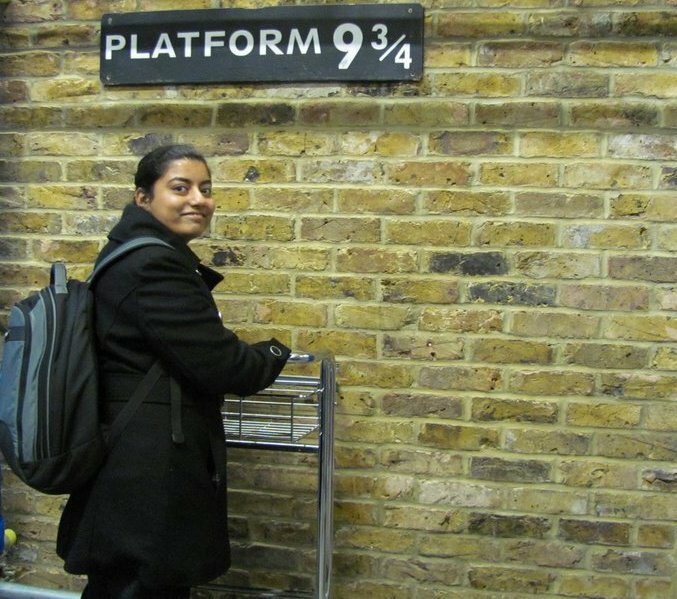 I even made a special trip to London’s King’s Cross station to take a picture at Platform 9¾. I have always complained that the films never matched up to the standards of the book in terms of delivering suspense and excitement. In spite of this, I have made it a point to watch the first day first show of all the Harry Potter films in whichever part of the world I am in. After years of attachment and months of anticipation, I went for the first day first show of Harry Potter and the Deathly Hallows Part I yesterday at 0900 GMT. I booked a ticket for the movie a month in advance. The movies have tried to follow the books storyline. However, what the book can say in over a thousand pages, a film cannot portray it in about two hours. Harry Potter and the Deathly Hallows have been divided into two parts. Part I released worldwide yesterday and Part II releases in July next year. I feel Harry Potter and the Deathly Hallows Part I has for the first time, done justice to the book. The film finally found a way to tell J. K. Rowling’s story to the world. As I was watching the movie, it dawned on me that the movie was the end of an era. The series has touched millions of hearts, including mine. I have spent almost a decade being a dedicated Harry Potter fan. For me the novels and the films are more than just a story. It is a part of my life. I have witnessed the characters come to life on the big screen. The end of the series, in a way, signals the end of my teenage years. In July 2011, bidding farewell to Harry Potter will be like saying goodbye to an old friend. From then on there would be no more Harry Potter books to read or Harry Potter films to watch. Harry Potter will always be “the boy who lived”.